VoiceOver: A screen reader describes aloud what’s on the screen. The screen reader can read e-mail messages, Web pages, and more. Zoom: This tool is a screen magnifier for those who are visually challenged. To zoom, double-tap the screen with three fingers, and drag three fingers to move around the screen. White on Black: This tool reverses the colors on the iPhone to provide a higher contrast for people with poor eyesight. Mono Audio: If you suffer hearing loss in one ear, the iPhone can combine the right and left audio channels so that both can be heard in both earbuds. Speak Auto-Text: When this setting is on, the iPhone automatically speaks autocorrections and capitalizations. 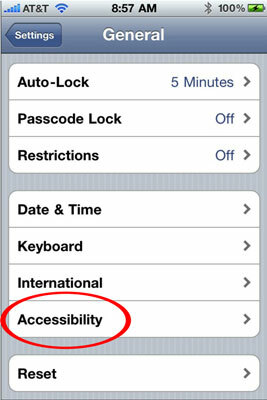 On the iPhone Home screen, tap Settings→General→Accessibility. The Accessibility Settings screen appears. Slide the On/Off button to turn on a tool. Slide it again to turn off that tool. Double-pressing the Home button launches multitasking. But you can set up the iPhone so that triple-pressing the button (pressing three times really fast) turns on certain Accessibility features. By doing so, you can turn VoiceOver on or off, Zoom on or off, or White on Black on or off.